The depth of content and immediate practical application of this programme is outstanding! The catalyst for massive change at the individual, team & enterprise level, that creates the standard to strive for. The most amazing workshop I've ever been on. 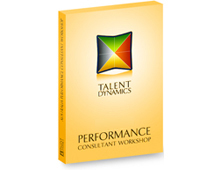 25 Talent Dynamics Profile Tokens (Total value of AU$3750 for resale by you – AU$150 each). Opportunity to purchase additional Profile Tokens throughout the year for resale at 50% discount (AU$75).